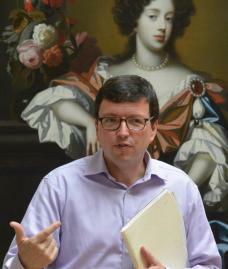 Tim Barringer is Paul Mellon Professor of the History of Art. He specializes in the eighteenth-, nineteenth- and twentieth-century art of Britain and the British Empire, nineteenth-century American and German art and museum studies. Following positions at the Victoria and Albert Museum, the Universities of London and Birmingham in Great Britain, he came to Yale in 1998. In 2013-14 Tim Barringer held a J. Clawson Mills Fellowship at the Metropolitan Museum of Art, New York. His books include ‘Reading the Pre-Raphaelites’ (Yale, 1998), ‘Men at Work: Art and Labour in Victorian Britain’ (Yale, 2005) ‘Opulence and Anxiety’ (2007), catalogue for an exhibition at Compton Verney, ‘Before and After Modernism’ (Central St Martins, 2010) and ‘David Hockney: 82 Portraits and 1 Still Life (Royal Academy, 2016). In 2018, a new collection of essays ‘Victorian Jamaica’ (co-edited with Wayne Modest) was published by Duke University Press. Barringer was curator with Andrew Wilton, ‘American Sublime: Landscape Painting in the United States, 1825-1880’ (London: Tate, 2002). With Gillian Forrester and Barbaro Martinez-Ruiz, he curated ‘Art and Emancipation in Jamaica: Isaac Mendes Belisario and his Worlds’, (Yale, 2007). The accompanying book was awarded the Alfred Barr Prize of the College Art Association. With Alison Smith and Jason Rosenfeld be curated ‘Pre-Raphaelites: Victorian Avant-Garde at Tate Britain’, London; National Gallery of Art, Washington DC; Pushkin Museum, Moscow; Mori Arts Center, Toyko, and Palazzo Chiablese, Turin. He was curator of ‘Pastures Green and Dark, Satanic Mills’, an exhibition of landscape painting from the National Museum of Wales at Princeton University Art Museum and other venues in 2015-16. Most recently in 2018 he was curator, with Elizabeth Kornhauser, of ‘Thomas Cole’s Journey: Atlantic Crossings’ at the Metropolitan Museum of Art and the National Gallery in London. He also worked with a Yale team to curate ‘Picturesque and Sublime: Thomas Cole’s Transatlantic Inheritance’ at the Thomas Cole Historic Site in Catskill, NY. Tim Barringer has been active as an advisor of Ph.D. dissertations at Yale, has served as Director of Undergraduate Studies and Director of Graduate Studies in the History of Art Department and was winner of the Sarai Ribicoff teaching prize in 2004. In 2009 he was the Slade Professor of Fine Art at the University of Cambridge. The lectures, ‘Broken Pastoral: Art and Music in Britain, Gothic Revival to Punk Rock’ will appear as a monograph. Selected publications include ‘Benjamin Britten, Samuel Palmer and the neo-Romantic Pastoral’, Art History, February 2011, and ‘Seeing With Memory: Hockney and the Masters, David Hockney: A Bigger Picture, London: Royal Academy of Arts, 2012; “Poetry” to the catalogue of ‘Rubens and his Legacy’, edited by Nico van Hout, 2014, ‘The Patcham Chattri’, in Michael Walsh, ‘The Great War and the British Empire: Culture, Identity, Memory’ and introductions to exhibition catalogues of artists Derek Hyatt and Malcolm Morley. A collection of essays, ‘On the Viewing Platform: Perspectives on the Panorama’(co-edited with Katie Trumpener) will appear with Yale University Press in 2020. In Spring 2019 he will deliver the Paul Mellon Lectures at the National Gallery, London, on “Global Landscape in an Age of Empire.” The exhibition ‘Radical Victorians’ will tour US venues in 2018-20, including the Yale Center for British Art. Art and the British Empire, edited with Geoff Quilley and Douglas Fordham (Manchester: Manchester University Press, 2007). ‘Sonic Spectacles of Empire: The Audio-Visual Nexus, Delhi-London, 1911-12’ in E. Edwards, et al, eds., Sensible Objects: Material Culture, the Senses, Colonialism, Museums (London: Berg, 2006).